We just might be getting our stripers in for the season. Our now-local anglers (formerly from Riverside, Calif.) Dave Grant, and brother Matt Grant, were fishing from shore and using anchovies in the Palo Verde area. 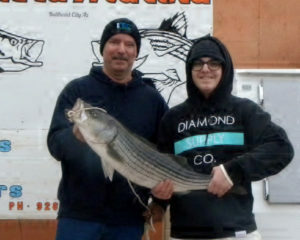 Dave hooked a nice striper, and with the help of his brother Matt, landed a nice 13 .54-pound striper at 33 and 1/2 inches (above). They were telling me that they had a couple of others in this size range in the same area but no luck getting them to the bait. Sometimes it helps when you hook into one to change your tactic a bit to try for another striper that might be in the area. Maybe switch to a lure like a Long A (Bomber) or a Pencil Popper to name a couple. It’s encouraging news for us here below the Davis Dam along the Colorado River to hear about these stripers starting to arrive in this area. We are not getting any stocking of rainbow trout from the federal hatchery due to the government shutdown. We are hoping for a good compromise soon. This is so we can get our trout back and hopefully before we get the caddis fly issue starting back up. I am sure the crew that is left behind is taking great care of the trout. Here below the Davis Dam the Community Park area should be producing a few trout — try some PowerBait and your favorite spinner. Up on Lake Mohave there is some striper activity being reported in the Telephone Cove area. I haven’t seen any as of yet, but fishing should be doing OK near the dam or by the power lines. A good bait of choice is cut anchovies or your soft lures in a white. No word on the largemouth or smallmouth bass as of yet. Hope this helps for now and we look forward to seeing you in soon to share your catch and story — thanks for all of your support. Now Go Catch A Fish.